Steven (Chicagoland, United States) on 7 June 2010 in People & Portrait and Portfolio. Statue seen at the entrance to the memorial for Presidential Franklin Delano Roosevelt. Though not original to the memorial's design, the National Organization on Disability, headed by the efforts of Alan Reich raised $1.65 million over two years to fund the addition of this statue that showed President Roosevelt in a wheelchair. In January 2001, the additional statue was placed near the memorial entrance showing FDR seated in a wheelchair much like the one he actually used. The memorial's designer construed the wheelchair controversy as evidence of success, because "the most important thing about designing is to generate creativity in others, and to be inclusive – to include the needs and experiences of people interacting with the environment, and to let them be part of its creation." One morning in 1921, when Roosevelt was 39 years of age, things changed for him and for the world. He had contracted polio, a disease that was rather common in those days. Because of the resulting condition, called "poliomyelitis", FDR couldn't get out of bed. In fact, his legs didn't work at all. And in the days when people with physical disabilities, known then as "invalids", were hidden from public view, FDR decided to move ahead with his career while hiding his disability from the public. Roosevelt built a wheelchair using bicycle and tricycle parts and a kitchen chair, then rolled forward to eventually be elected to four presidencies and lead the U.S. through the end of the Great Depression and World War Two. "Franklin's illness . . . gave him strength and courage he had not had before. He had to think out the fundamentals of living and learn the greatest of all lessons -- infinite patience and never-ending persistence." Beautiful treatment on this well taken shot ! In its subtlety and modesty a very impressive monument! Yes I too love the treatment here..the composition is almost "out of the world"...I am also sort of reminded by a scene I believe from one of Orson Welle's films - sure can't remember which one - nevertheless, I just can't stop looking at it - quite mesmorizing - great work Steven. Wonderful find and super treatment ! Superb compositon and monochrome's very beautiful Have a lovely afternoon Steven. Remarkable image and narrative of those achievements . . lots to think about in that, even now. An amazing image! The inscription is quite touching. Excellent photo. 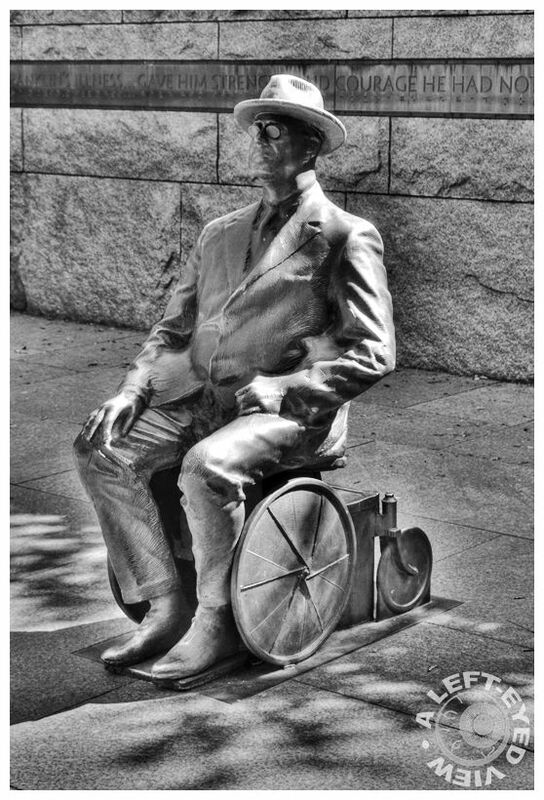 I remember the controversy over this particular statue's use of the wheelchair, because FDR went to great pains to not be seen as one with a handicap or as some prefer it now, differently mobile. A very stoic post and for a moment I thought he was real! Well done.